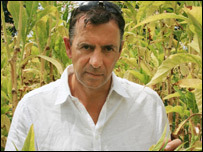 BBC Two aired Duncan Bannatyne Takes on Tobacco last night (1 July) where Duncan Bannatyne, businessman and also famous for Dragon’s Den, travelled to Africa to see how tobacco companies tried different techniques to market their goods to children. He travelled to Mauritius, Malawi and Nigeria to see how tobacco companies tried to entice children in their early teens to start smoking. One name that kept coming up was BAT or British American Tobacco which sold under different brand names such as Embassy. Although advertising cigarettes is banned in these countries, BAT came up with some rather innovative and cunning waysto promote their brand name. It was really disgusting to see how tobacco companies saw young children merely as potential markets to sell their wares to and were more than happy to trade their values for profits and rich dividends for their shareholders. Gearing promotion specifically towards children in order to get them addicted to cigarettes is not only unethical but also immoral. Some people might find this programme biased against the tobacco industry, but this can be judged from its title. It can be seen again on the iPlayer, just click on the link below.